Puppies are raised inside our home and are handled and loved daily by children. 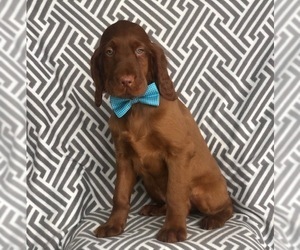 Puppies are available to approved loving homes. The puppies in this litter are from AKC Registered parents and can also be registered with the AKC. Items Included: Current Vaccinations, dewormed, health gaurentee. 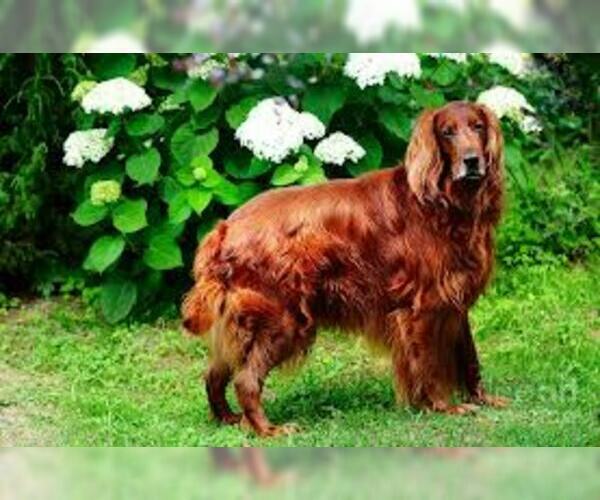 Overview: The Irish Setter is one of America's favorite breeds. These dogs are loyal and protective, yet have a playful nature. He needs plenty of room to romp and enjoys being on family outings. Coat: Flat, straight and of moderate length with longer feathering. Temperament: This breed gets along well with children, other dogs, and most household pets. They are extremely friendly with welcomed visitors. Care: The coat needs regular brushing and combing every 2 to 3 days, plus some clipping and trimming. Training: This breed trains well, with a consistent training approach. Training should begin at an early age. 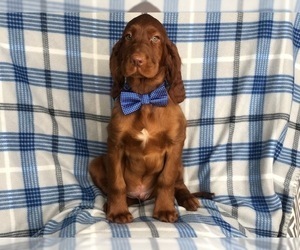 Activity: The Irish Setter needs plenty of exercise, so long walks are required. Health Issue: This breed tends to bloat and is prone to epilepsy and severe skin allergies. Also, they may suffer from eye problems and elbow and hip dysplasia. 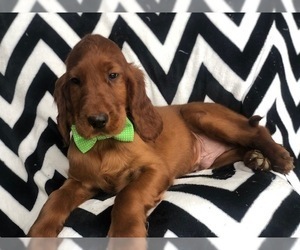 Posted Breed: Irish Setter (medium coat). 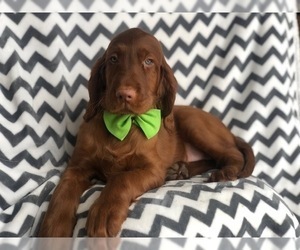 Posted Breed: Irish Setter / Chocolate Labrador Retriever (medium coat).